The Museum of Modern Art (MoMA) in New York City is gearing up to open a brand new exhibit - Century of the Child: Growing by Design, 1900–2000, a wonderful retrospective of design for children spanning over the last century. The exhibit is a mash up of the familiar and unfamiliar, bringing together everything from school architecture, playgrounds, clothing, books, toys and games, nurseries, furniture and more! But don't worry about getting lost in time or type in the halls of the museum, Century of the Child is expertly curated and organized in chronological sections, exploring themes via a mix of design typology, material, scale and location. While the exhibition is definitively for adults to enjoy tot-sized versions of every modern design they've ever loved, there are a handful of interactive elements that kids will certainly enjoy as well. And, at the very least, you can show your mini-me's what playtime meant before iPads and X-Boxes. The exhibit officially opens on July 29th, but keep reading to get an exclusive sneak peek right here on Inhabitots! 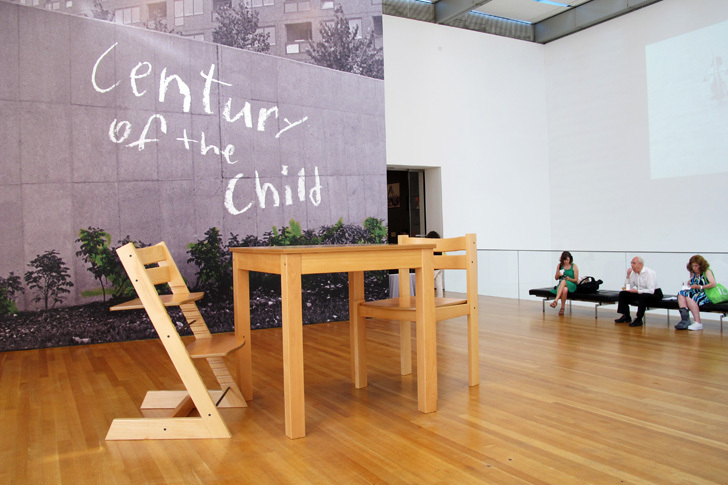 Century of the Child: Growing by Design 1900-2000 will be on view at MoMA in NYC from July 29th until November 5th, 2012. If you’re not able to make it out to The Big Apple, you can also purchase an enhanced digital book via Apple’s iBookstore. The digital edition comes with high-res images and supplemental audio and video. Maria Montessori's last name may sound familiar, and for good reason - the enterprising Italian is the brains behind the Montessori teaching method that has been adapted worldwide. While in medical school she developed an interest in the creative potential of children with learning difficulties and devised a teaching method that was aimed at stimulating a child's senses and curiosity through play. Above you can see a set of colorful and shapely teaching materials simply constructed from painted wood and various materials. The Fabrik (Factory) Construction Toy is the creation of Austrian designer Josef Hoffman. Designed in the 1920s, Hoffman's set references industrial production and a modern urbanscape. While seemingly adult at first glance, the set was indeed designed for children. Like most toys in Vienna at the time, the toy is completely handmade and was relatively expensive. Czechoslovakian Minka Podhajska created these painted wood figurines back in 1930. These unconventional yet playful children's dolls have been aptly dubbed "Series of Personifications of Childhood Misdeeds" -- the set even comes with disgruntled adult figurines. This painting, "The Bad Child", and chair were created by Antonio Rubino for his friend's young son. Rubino had a taste for the off-kilter which is seen not only in the strange scene of the painting, but the odd shape of the chair. Rubino is quite the figure in Italy -- he was a well-known children's illustrator back in the day and launched the ever popular kids' magazine "Corriere dei Piccoli". 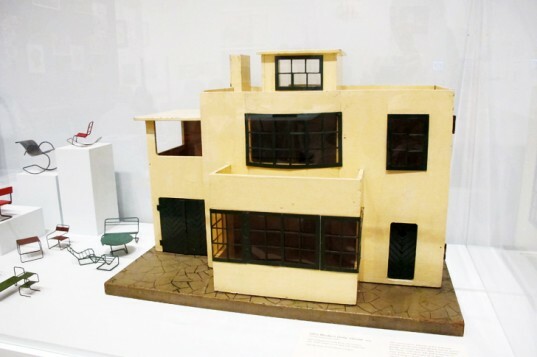 This Ultra Modern Dolls' House was manufactured by Lines Brothers Ltd in London back in 1938. The snazzy contemporary abode features a flat roof, metal window frames, built-in garage, and working lights on both the interior and exterior. Unfortunately, the home was not nearly as popular as the classic Tudor or Elizabethan-style dollhouses, and the company eventually dropped it from its line. This simple toy fuses several ideas into one educational tool that cultivates imagination with learning numbers, all while keeping things organized and tidy! The toy cart was designed by Danish Kaj Bojesen back in the 1930s and is made simply with wood and rope. Designed back in 1952 by Henry Glass, this cool colorful toy chest could easily fit with any home decor, even today. The chest was designed as part of the Swingline Juvenile Furniture Series which also included a bed, dresser, bookcase, chair and easel -- talk about cultivating creativity! The accompanying chair above is by Harry Bertoia. This splendid rocker is what modernist parents' dreams are made of. A design by Gloria Caranica, the 1970s child rocker has been made simply yet sturdy with bent plywood and painted wood. This beautiful modern piece could have easily inspired a slew of children to become designers. It was originally created as a prototype desk for the Bowditch School in Chicago. If you've ever wondered what the first Barbie Dream House looked like, here you go. Distinctly modern, but certainly more subdued than the pink monstrosity Barbie plays house in these days, the cardboard studio apartment could be folded down compact when not in use, and carried around like a suitcase. An outer space-inspired room attracts curious adults and kids alike. The pieces on display date back up to 100 years and feature everything from tin robots to paper space shuttles. Here are some creative, colorful and inspired tot-sized toys dating back to the 60s and 70s from Fredun Shapur and Verner Panton. Bruno Munari is best known for his children's books, but the famed author also tried his hand at industrial design back in the day. Seen above, Abitacolo (Cockpit) is a modular bed and play environment that kids can customize and imaginatively control. While minimal, as Munari explained "[it's] every moment transformable." Eero Aarnio's Puppy is surely a familiar sight. The designer created the glow-in-the-dark canine back in 2004 for the Italian company Magis' Me Too collection. Puppy is designed as an abstract plastic bubble-dog sculpture/toy/seat. Aarnio shirked the idea of scaling down adult furniture to kid-size and instead studied what kind of furniture youngsters would want to correspond to their pint-sized world.